The termination of Chinese Communist Party (CCP)-sponsored Confucius Institute in New South Wales (NSW) may be underway, after concerns over potential “foreign influence” were confirmed by NSW Education Minister Rob Stokes on June 11. Among the Minister’s concerns, one is related to the academic control and staffing decisions of the Confucius Institute (CI). “Obviously I have concerns,” Stokes told The Australian. “We’re happy to provide programs and partnerships with external organisations but we just need transparency over the terms and conditions. “If we can’t get that, we can’t offer it,” he said. CIs work directly under the CCP’s Ministry of Education through Hanban, or the Office of Chinese Language Council International in China. All aspects of operations, from hiring teachers to teaching materials, are controlled by the CCP’s ministry. According to the U.S. National Association of Scholars (NAS), teachers who are hired by Hanban lack formal academic freedom and are pressured to avoid certain topics such as the Tiananmen Square massacre, Tibet, Taiwan, Falun Gong, and any criticism of the CCP’s legitimacy. Discriminatory hiring practices and espionage have also been reported. Under the government’s new Foreign Influence Transparency Scheme, however, this arrangement would equate to foreign interference in a government body. It is believed that reports of CCP infiltration in Australian politics, including political donations from Chinese donors, had forced the Education Minister to undertake the review, according to The Australian. Since the review was announced in May, the NSW government has suspended all Hanban-funded trips to China. 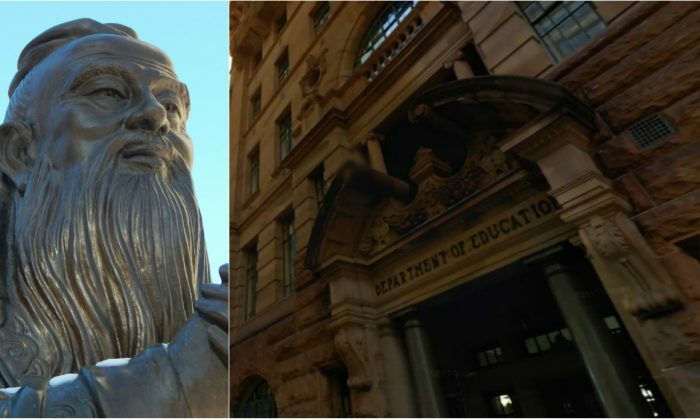 On June 11, a spokesman for Stokes told The Australian, “A memorandum of understanding to establish a Confucius Institute, within the NSW Department of Education and Training, was first signed in July 2010—under the Ken­eally Labor government.